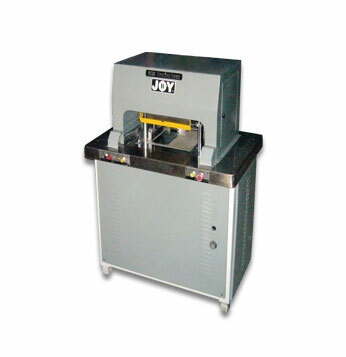 JOY's commitment to the Binding (Post-Press) industry, for providing off-line economical dedicated solutions for preparing and finishing Book-blocks for soft/hard cover requirement; is further extended by adding Booklet Three Side Trimmer to the range. Semi-automatic Three Knife Trimmer with manual feeding of Booklets to meet the demand of higher production with maximum operator efficiency and safety. Ideally suited for finishing of Booklets (Centre Stitched / Sewn), Exercise Note Books and Book-Blocks etc. Hydraulic Clamping and Cutting mechanism is very simple to operate and maintain. Size changeover is very quick and easy with the help of Clamp Boards. The castors are provided for convenient manoeuvre for maximum utilisation of space. Mechanical Safety Device in addition to Sensor Curtain for optimum operator safety.